A Boston-Nigerian woman has filed a lawsuit demanding $3.4million plus interest, costs and attorney's fees after alleging that an American Airlines flight attendant destroyed her wedding dress as she was travelling to her ceremony. Yewande Oteh claims she 'suffered severe diarrhea, dehydration and depressive symptoms' after a flight attendant went into an overhead bin and dumped red wine on her wedding dress in court papers filed by her mother in United States District Court, District of New Jersey. 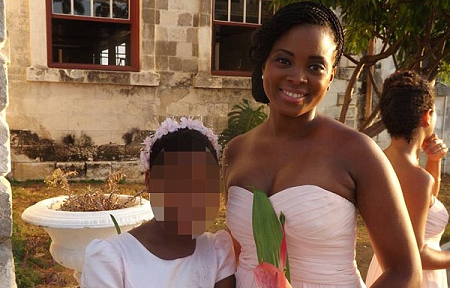 She also claims that she remained 'physically and emotionally ill over the next week' and was unable to enjoy her Jamaican wedding, which took place back in August 2015. Yewande filed the lawsuit against American Airlines and not the flight attendant 'Melanie Masters,' whose 'willful and wanton conduct has caused her a lifetime of damage,' reports claim. American Airlines told DailyMail.com in a statement that they are reviewing the lawsuit.